Jesse Jones’s practice reflects and re-presents historical moments of collective resistance and dissent. In her films and videos, she explores the gesture of the revolutionary action and finds resonance in our current social and political landscape. 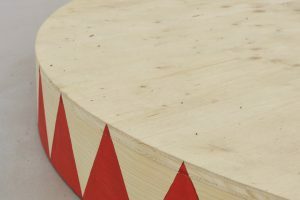 Jones has exhibited extensively internationally, including recent solo exhibitions at Spike Island, Bristol, the Hugh Lane Gallery, Dublin, and REDCAT, Los Angeles, as well as organized “12 Angry Films,” a temporary drive-in cinema project in Dublin. Upcoming solo exhibitions include Artsonje Centre, Seoul, and CCA. Her film project The Struggle Against Ourselves (2011) departs from the biomechanic movement workshops of Russian theater director Vsevolod Meyerhold and the eventual Hollywood appropriation of related techniques, while her newest work, The Selfish Act of Community (2012), explores historical experiments in conflict-resolution therapy as a type of Brechtian script.